Oklahoma is home to 21 species of oak trees, some of which reach majestic proportions. These all-purpose giants provide shade, wildlife food and shelter, erosion control, and autumn color. They tolerate a wide range of light conditions, soils, and temperatures across all four of the Sooner State's USDA plant hardiness zones. Planting one of these dependable trees will beautify your landscape for generations. The largest of Oklahoma's Shumard oaks (Quercus shumardii) graces the southeastern part of the state. Measuring 99 feet high with a branch spread of the 111 feet at the crown, it stands in Oklahoma's McCurtain County. 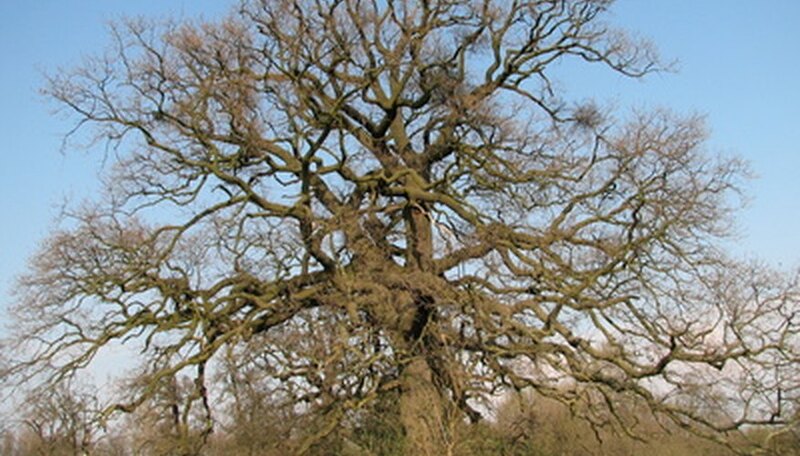 Most Shumard oaks, however, reach 50 to 75 feet, says the Oklahoma Cooperative Extension Service. Shumard oaks have straight, frequently buttressed trunks. Their bristled, deep-green 7-inch leaves provide scarlet autumn color. Pest-free and hardy throughout Oklahoma, these oaks produce three-quarter-to-1-inch acorns. Disease-resistant Shumard oaks grow along Oklahoma's stream banks and in moist woods. Tolerant of minor flooding and drought, these trees like sun to partial shade. They're not fussy about soil, handling sand, loam, clay and limestone-rich locations. Their young leaves and raw acorns are mildly toxic if ingested. McCurtain County is also home to Oklahoma's largest white oak, measuring 82 feet tall with 86-foot spread. Plant white oaks for fall color, recommends the Oklahoma Cooperative Extension Service. They can grow as high as 100 feet, with straight trunks, stout horizontal branches, and gray or greenish red twigs. Their blue-green, 8-inch lobed leaves become burgundy in autumn and remain on the trees over the winter, according the Lady Bird Johnson Wildflower Center. White oak bears annual crops of acorns, with one to three nuts on each stem. Plant it in a sunny to shady location with moist, deep sandy or loamy soil. Acidic (pH below 7.0) to pH neutral (7.0) soil is best. South central Oklahoma's Love County boasts the state's largest bur oak (Quercus macrocarpa), standing 84 feet high and 95 wide. An Oklahoma Cooperative Extension Service choice for its drought tolerance, bur oaks often exceed 100 feet in height and width. Most are wider than they are tall. Exceptionally stout trunks--the Love County tree's measures 17.5 feet in circumference--support heavy, horizontal branches. Green, lobed leaves are up to 9 inches long. Fringed-cap acorns up to 1.5 inches wide are the largest of those of U.S. native oaks. Drought-and-pollution-resistant bur oak grows rapidly into a good shade tree, advises the Lady Bird Johnson Wildflower Center. Plant it in Sun to shade and acidic soil. It handles dry or moist soils of all types.